A delve into the new HomePod firmware, and developer documentation shows that Apple's forthcoming smart speaker will process full Siri queries on a synchronized iPhone or iPad rather than refusing them, or processing them on-device. Alongside the iOS 11.2 beta and HomePod firmware update, Apple noted that full SiriKit requests, such as those involving contacts, Messaging, Lists, and Notes will be handed off to a connected iPhone or iPad for processing. Looking further at developer documentation, music-related requests look to be handled independently on the device, and won't require handoff to a linked device. Developers can test app compatibility for voice-only Siri requests by connecting headphones into an iPhone or iPad running iOS 11.2. Apple's $349 HomePod was revealed at the 2017 WWDC and will ship in December. 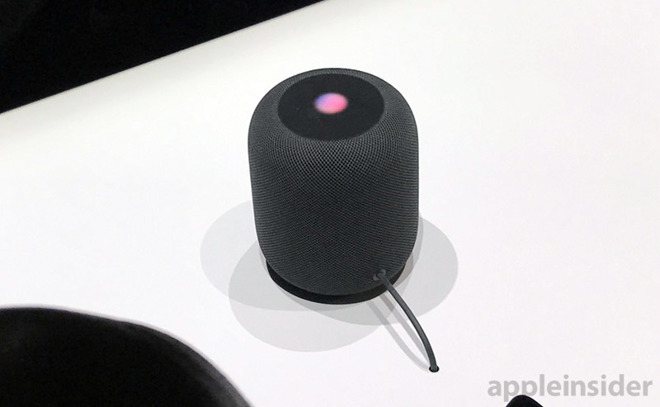 The HomePod is powered by an Apple A8 chip featuring realtime acoustic modeling, audio beam-forming, and multi-channel echo cancelation. It also features a subset of Siri, optimized for music consumption. Apple has been forthcoming about what the device will be capable of at launch since it was announced at the 2017 WWDC. The developer's notes surrounding iOS 11.2 are the first indication of how the HomePod would handle more conventional Siri requests. "One of the advantages that we have is that there are a lot of things that Siri knows to do from the cloud," Apple CEO Tim Cook said in an interview shortly after the debut of the device. "We'll start with a batch of those as (marketing chief) Phil (Schiller) showed you today during the keynote, and then you can bet that there's a nice follow-on activity as well." Earlier firmware examinations suggested that the A8-powered HomePod will boast 1GB of RAM and a 272-by-340 pixel screen, suggesting that rudimentary app support will be possible for the hardware in the future.